Following on from our Christmas Charity fun day held in our Glasgow office on Friday 7th December to raise funds for three chosen charities, we have been along to the Royal Hospital for Sick Children to present a cheque to the John O’Byrne Foundation. Steven Morrison, Technical Support Manager and David Sweenie, Operations Manager from our Refrigeration division handed over the cheque. 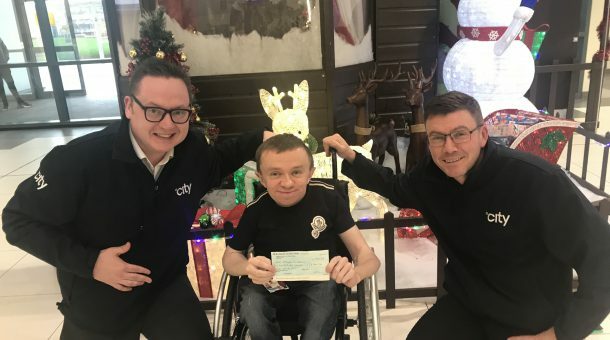 John was extremely grateful for this money and he stated that it will be used to buy gift vouchers as a surprise for the sick kids who have to stay in hospital over this Christmas period. There will be a showing of Elf the Movie on Christmas eve for those kids and John will give everyone a voucher as soon as they go into the purpose built “MediCinema” within the hospital to watch the film.